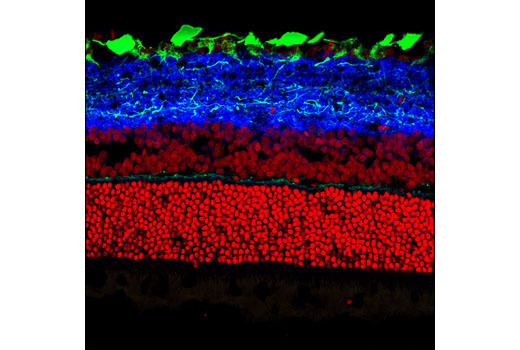 Confocal immunofluorescent analysis of rat retina using Synapsin-1 (D12G5) XP® Rabbit mAb (Alexa Fluor® 647 Conjugate) (blue) and Neurofilament-L (C28E10) Rabbit mAb (Alexa Fluor® 488 Conjugate) #8024 (green). Red = Propidium Iodide (PI)/RNase Staining Solution #4087. Synapsin-1 (D12G5) XP® Rabbit mAb (Alexa Fluor® 647 Conjugate) detects endogenous levels of total synapsin protein. The antigen is 100% conserved between human synapsin-1a and synapsin-1b. Monoclonal antibody is produced by immunizing animals with a synthetic peptide corresponding to residues surrounding Gln483 of human synapsin-1 protein. Synapsins, a group of at least five related members (synapsins Ia, Ib, IIa, IIb, and IIIa), are abundant brain proteins essential for regulating neurotransmitter release (1,2). All synapsins contain a short amino-terminal domain that is highly conserved and phosphorylated by PKA or CaM kinase I (1). Phosphorylation of the synapsin amino-terminal domain at Ser9 inhibits its binding to phospholipids and dissociates synapsins from synaptic vesicles (2). Greengard, P. (1987) Mol Neurobiol 1, 81-119. Hosaka, M. et al. (1999) Neuron 24, 377-87.